Discovery STS-133 mission specialists Mike Barratt and Nicole Stott are in the process of using the International Space Station's robotic arm to manoevre the Permanent Multipurpose Module (PMM) from the shuttle's payload bay towards its final home on the orbiting outpost's Unity node. By this evening, the orbiting outpost will have gained "2,472 additional cubic feet of pressurized volume for storage and scientific use" in the converted Leonardo Multipurpose Logistics Module. Discovery blasted off from Kennedy Space Center last Thursday on its 39th and final mission, to deliver the module and vital spares for the ISS. 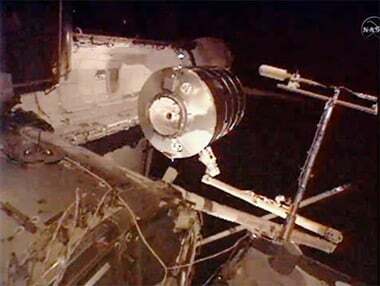 It docked on Saturday, and on Monday spacewalkers Steve Bowen and Al Drew wrapped "a six-hour, 34-minute spacewalk Monday, moving a failed 800-pound ammonia pump module, installing an extension cable and extending the rail track along the station's main truss". Following that, NASA decided to extend Discovery's swansong by one day, to allow the crew to fully "set up" the PMM. Bowen and Drew will venture outside again tomorrow for their second EVA, which will include various maintenance tasks.